Horse enthusiasts are a dedicated bunch. Between the time and energy spent on their equine companions and the camaraderie developed with like-minded people, recreational horse ownership is all-encompassing for devotees. It's little wonder that enthusiasts, who spend an estimated $2.9 billion annually on their horses, embrace equine technologies that allow them to share information about their animals and manage all the facets of horse ownership. Two years ago, Dr. Danny Michaels, owner of a 14-year-old American paint horse, was having trouble keeping track of his horse's vaccination records, feed information, vet appointments, and specific care regimen. "I wasn't able to keep track of all the millions of things involved in owning a horse, so I made an online database for myself," says Danny, a software developer and information technology solutions expert. "I showed it to friends who owned horses and they loved it." Realizing that his concept could benefit other horse enthusiasts, Danny began beta testing EQUITAG™, an online solution designed to store and share equine data and build community among horse owners, caregivers, and the horse industry. The business went live in October, 2014. "I contacted Metalphoto of Cincinnati because I wanted a durable aluminum product that could withstand wear and tear in a barn." The EQUITAG solution relies on a quick response (QR) code that is embedded within an anodized aluminum identification tag. 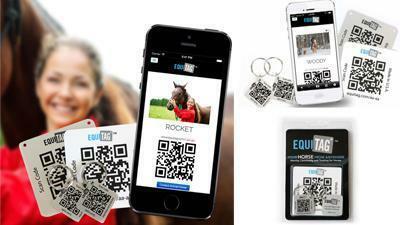 People purchase the tags and receive an individualized QR code to track their horse. Using a free app on their smartphone or tablet, the ID tag is scanned to access a single database containing the horse's medical and health records, emergency contact information, feed and training schedules, pictures and videos, upcoming events, and other relevant information. "Using EQUITAG is quick and easy," Danny says. "You sign up for the tag online, fill out the information, and share it with anyone you want -- a barn manager, caregiver, veterinarian, and family and friends. Once you receive your tags, you can scan the QR code to launch your horse's profile and see all of his details." Scannable QR codes are central to EQUITAG. During testing, Danny discovered that in order for the bar code to scan easily, high-contrast images worked best (a dark font on a light background). "I contacted Metalphoto of Cincinnati because I wanted a durable aluminum product that could withstand wear and tear in a barn, he says." "EQUITAG can help people at the barn save money and exchange information." MPC recommended Metalphoto® anodized aluminum for its superior abrasion and UV resistance. "There were a lot of benefits with the MPC-produced tags. During manufacturing, MPC fabricated them into squares, which works best for QR codes. Plus, the photographs and images were nice and clean with fantastic resolution." According to Danny, the application is especially useful to horse owners like himself who board their horses at a stable. EQUITAG provides the option to share the horse's information with barn managers and caregivers, who can verify a current feed or supplement schedule or upcoming vet appointment. "EQUITAG can help people at the barn save money and exchange information," he says. By connecting through EQUITAG, people can see each other’s event information, coordinate training and show schedules, and schedule same-visit vet and animal care appointments.